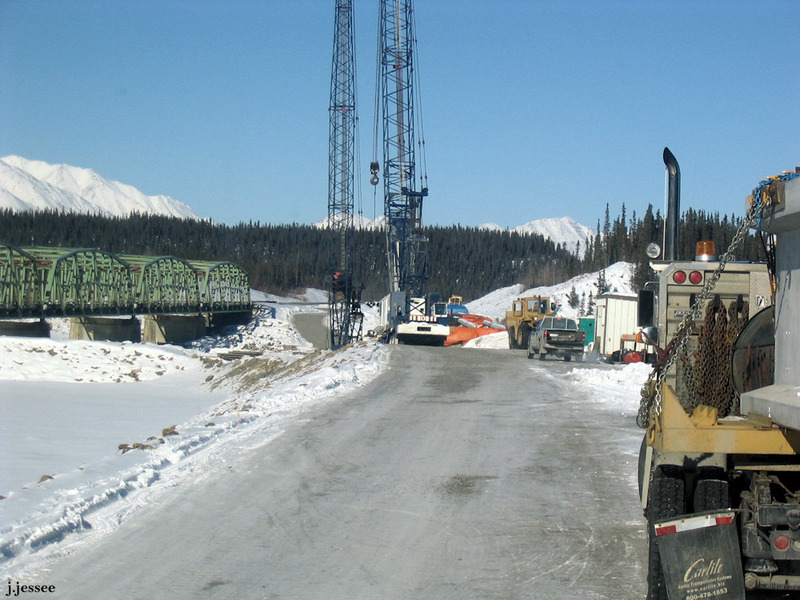 A few months after Jack helped haul bridge beams to the Donjek River Bridge in Canada, he went back to haul the beams from the staging area off the road onto the ice where they were constructing the bridge. (Best viewed if you click on the first one and scroll to the right.) See captions for more info. 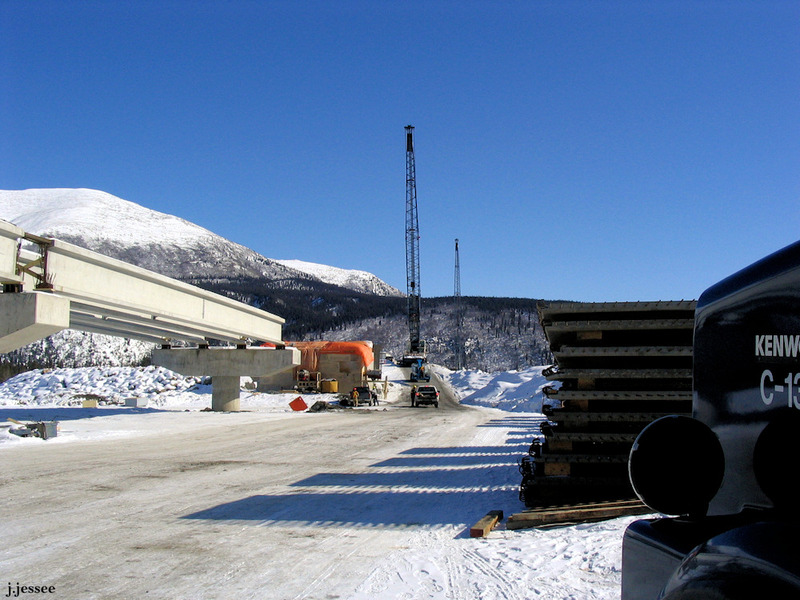 Two cranes are needed to pick up bridge beams, one on each end, since they will break if they are picked up from the middle. In the construction process they are pre-stressed to take weight from the top and won’t hold up if lifted from the middle. 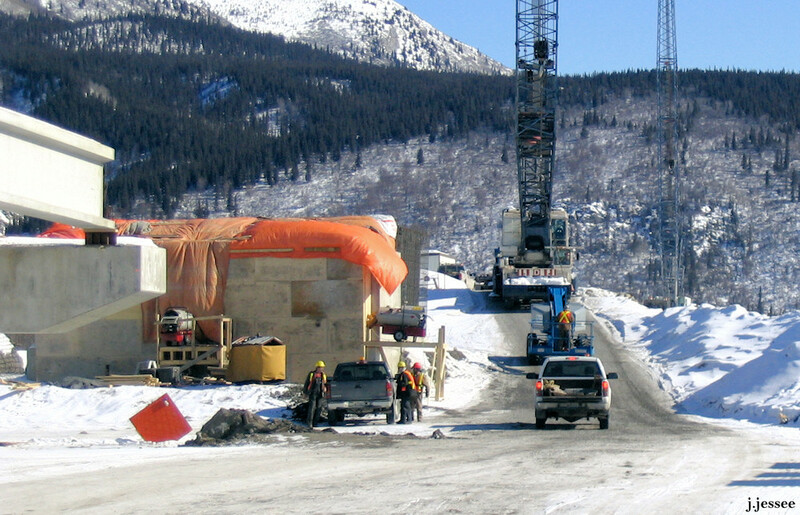 The old bridge is on the left and the cranes are moving down onto the river. 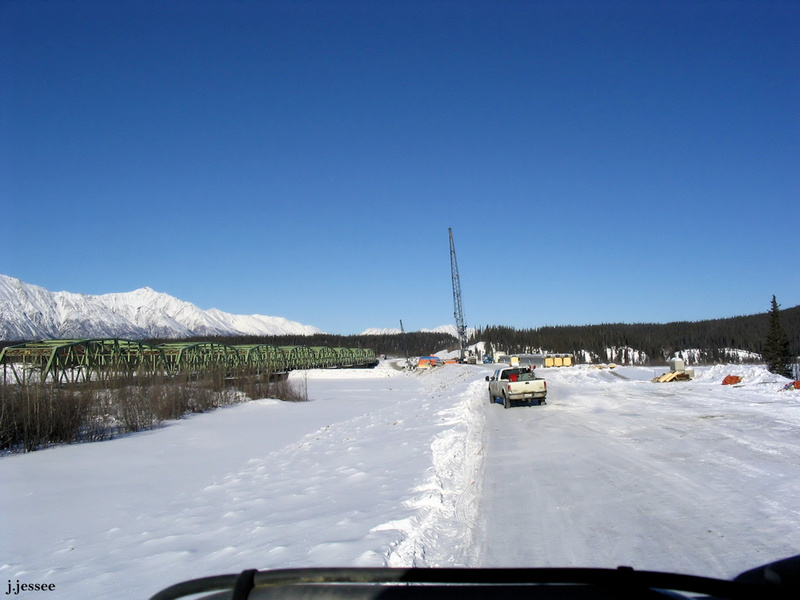 Jack is down on the frozen river here with the new bridge on the left and what looks to him like concrete joints on the right. The orange tarp is covering the concrete and keeping the warmth in from heaters so that it will cure. 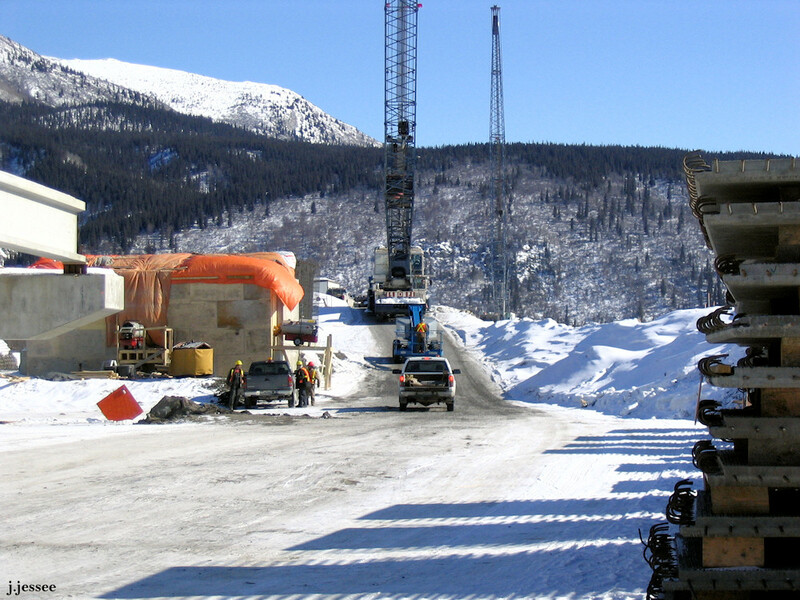 The 2 cranes are on their way up to the staging area where they will pick up the beams and place them onto the trailers for the trucks to bring them down to the river where the cranes will then pick them back up and place them on the bridge in their correct positions. 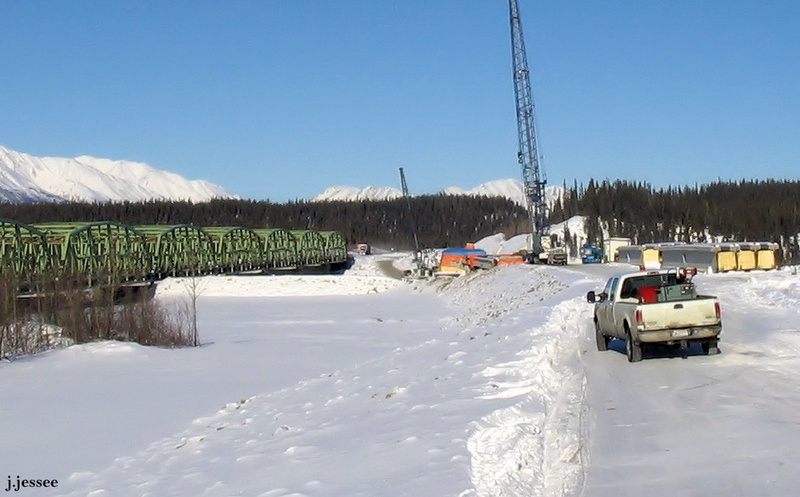 They are loaded and following the cranes back down to the river. 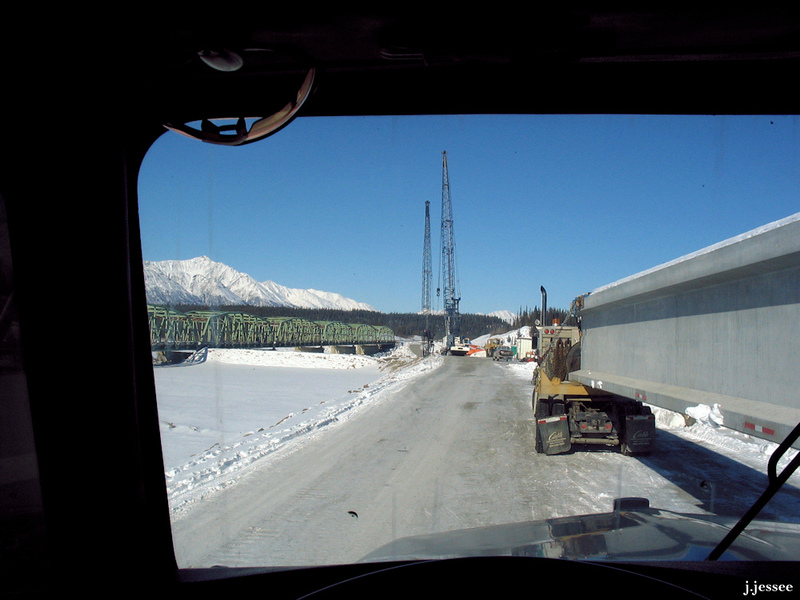 This entry was posted in Trucking and tagged alaska highway, bridge, bridge beam, bridge construction, bridge in Canada, canada, carlile transportation, cold, Donjek River, drive, driving on a frozen river, frozen river, highway, ice road, ice road truckers, jack jessee, road, transportation, truck, truck driving, trucker, trucking, vehicle, winter.